It's rather obvious by now: the netbook market is fast-growing. Not a week passes by without some laptop manufacturer launching their tiny one. While the netbook itself is quite diminutive in form, the market is already getting pretty homogenized. How else can you pimp a tiny little thing, really? That said, it's safe to say that the Red Fox Wizbook N1020i isn't exactly a unique snowflake. Its specs are expected: 1.6GHz Intel Atom processor, a gigabyte of RAM (thankfully, upgradeable to 2GB), and a 160 GB hard drive. It's 10.2-inch 1024x600 screen, WiFi a/b/g, and built-in webcam are standard-issue specs, as well. 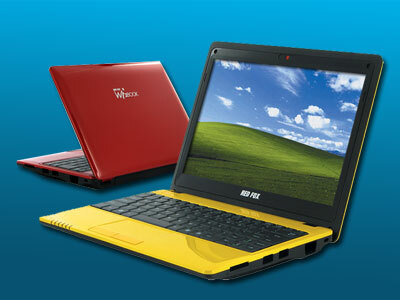 And based on build, the Wizbook is exactly what a netbook should be: sturdy, solid, lightweight. It should be perfect for any on-the-go dude looking to cram a report inside Starbucks. Except, the Wizbook's keyboard seems to be built for a lady. We know netbooks don't offer much in terms of size, keyboards being the main gripe of folks. But even then, this one feels like an XS. Better points of uniqueness are its ExpressCard/34 slot and Bluetooth 3.0 support. The ExpressCard/34 slot lets users fit in, among other things, a TV tuner. This will allow you to watch cable TV in between frantic cramming and updating your Facebook status. The Bluetooth 3.0 support, meanwhile, is simply an improvement over older Bluetooth tech—this allows for faster date transfer speeds, which is always a good thing.